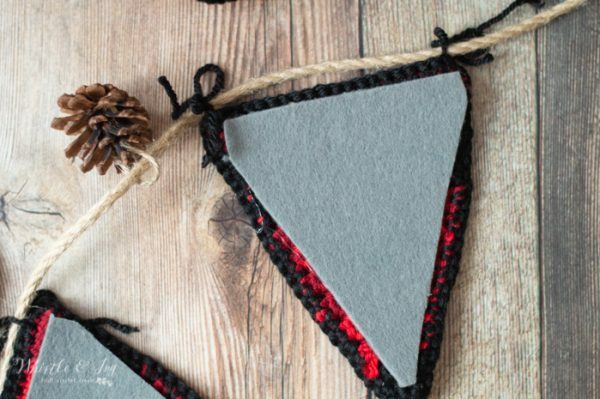 Learn how to make this trendy buffalo plaid triangle bunting, perfect for a holiday mantle, your rustic cabin decor or even a lumberjack baby shower. This post is proudly sponsored by Red Hearts Yarns, please consider using Red Heart Soft Yarn for your project, they are a huge supporter of Whistle and Ivy! 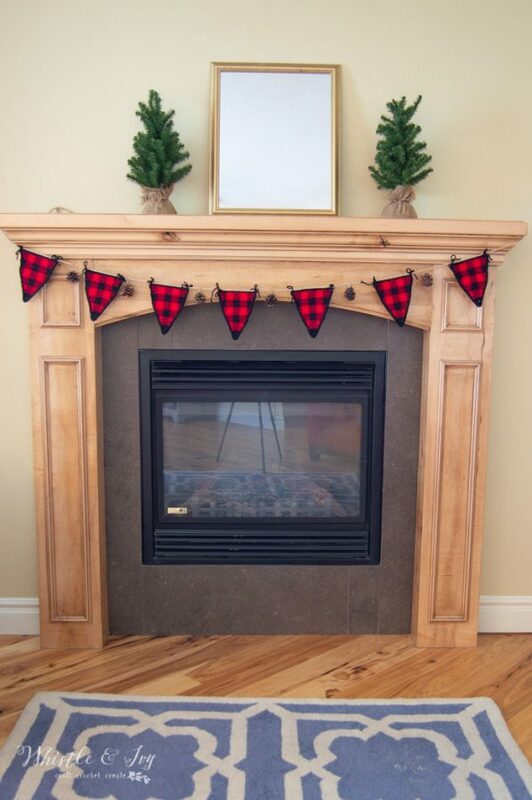 We are winding down Plaid Week and this crochet plaid bunting is the last piece of decor for the week. I am obsessed with decorating with buffalo plaid for Christmas so I had lots of ideas this time around. 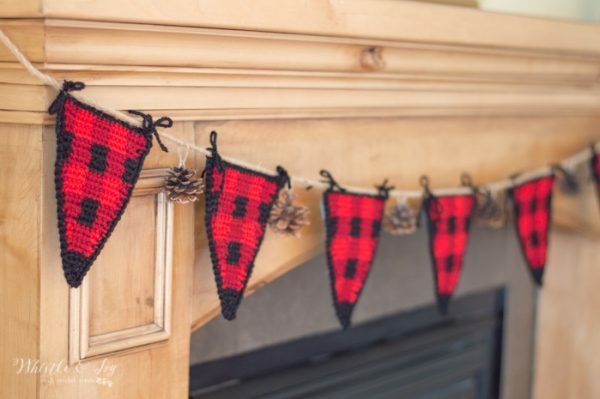 I love how this crochet plaid bunting worked out. I used Red Heart Soft, which is one of my favorite yarns for making hats, but it worked out beautifully for this garland. I also love that Soft has so many colors. You could give all sorts of color combinations a try ( I also suggest a black/white plaid scheme using Black, White and Light Heather Gray or Charcoal). This bunting can be a little bit confusing, but I hope you stick with it and take it slow. I detail how to do this bunting on my Plaid Course, so to avoid frustration I suggest enrolling! But please post your questions in our Facebook Group and I or other members can offer assistance. 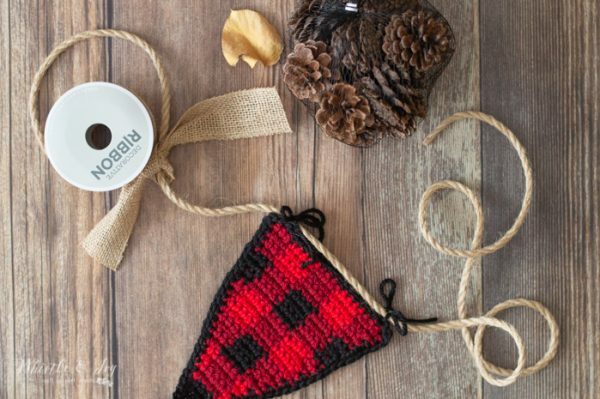 Please remember: You are free to use this crochet plaid triangle pattern to make and sell, but do not republish or distribute this pattern in any way. DO NOT use my photos in your listings. Please do share my blog links! It’s a quick and FREE way of supporting Whistle and Ivy and more free crochet patterns in the future. 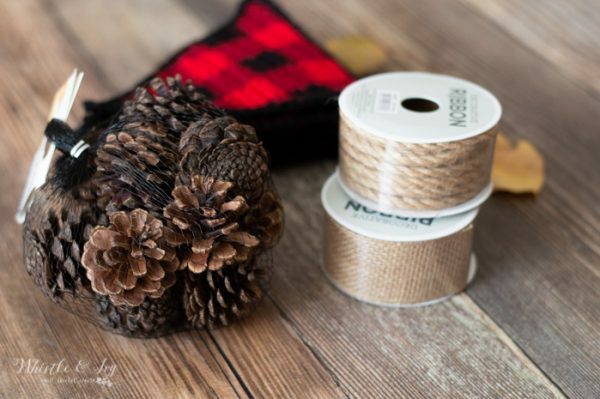 Notes: This crochet plaid triangle garland uses a 4 x 4 plaid technique, meaning the plaid block will be made up of 4 sts wide and 4 rows tall. The ch 1 does not count as a stitch, always work the first st in same st as the chain. Because you are working 4 consecutive rows of the same 2 colors, you will not need to carry your third unused color. When you need it again, pull it up and join. It will show along the edge, but you will cover it later with a border round. Pull up Black. Drop Red. Drop Black. Switch to Wine. 24. Ch 1. Sc in next 4 sts. Switch to Red. Sc in next 4 sts. Switch to Wine. Sc in next 4 sts. Switch to Red. Sc in next 4 sts. Switch to Wine. Sc in next 4 sts. Sc across the top of the plaid triangle. Work 3 sc in last st, forming a corner. Sc down the side, working your stitches as even as possible. When you get to the bottom, work 3 sc in bottom corner. Work back up other side, again working sc as even a possible. When you get back to the top, work 2 sc in same st as first black st. Join. You might want to consider blocking your plaid triangles before moving on. I even added a bit of thick felt to the back of mine for extra support. I eyeballed the shape and then hot glued it in place. Putting the crochet plaid garland together is fun! I originally started with bits of burlap ribbon tied onto string between the triangles, but the color didn’t pop with the wood on my fireplace, so I changed to pine cones. 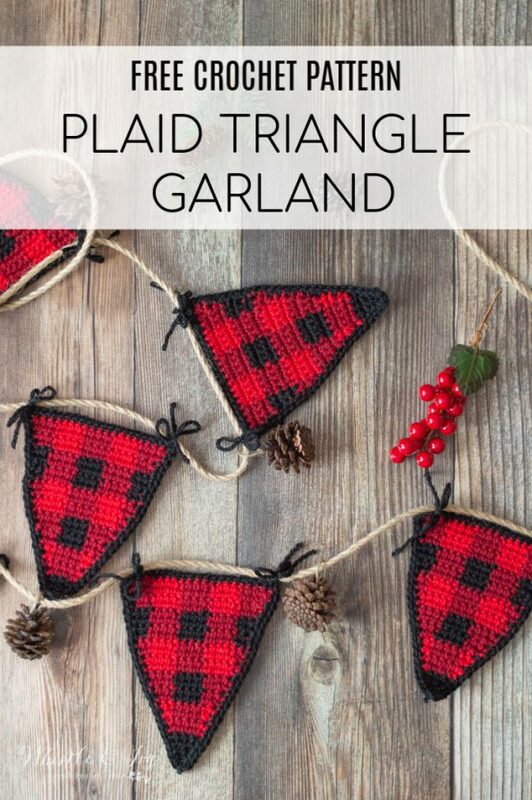 You can even simply string up the plaid triangles, they look adorable on their own. To attached the triangles to your jute rope by either hot gluing or tie them onto it with yarn. I wanted to give another shout out to Red Heart Yarns for sponsoring this post. Not only is “Soft” a lovely yarn to use for this project, but the people are Red Heart are some of the very best and are very supportive of Whistle and Ivy. Please show your appreciation by considering to use their yarn for your project. A bit of encouragement: I know that the increases can be a bit confusing, just take it slow and remember that the plaid blocks are 4 x 4, so you will change if you worked more than 4 sts in a row or if you worked more than 4 rows. And WHEN you do it, share it in our group! Is the stitch count for row 23, supposed to be (20)? Beautiful pattern, Thank you. Yes! Thank you for catching that, I will get it fixed. 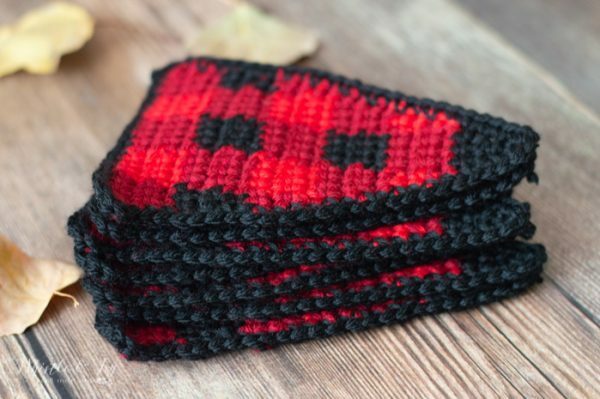 Where can I find cowl pattern?